This entry was posted in 5717 N Greeley, Lincoln Property Group, Metro Reports, SERA Architects, Wells Fargo Center, West of West. Bookmark the permalink. I fear it will still be very, very ugly. I remember when it was going up back in 1972, I believe, and I remember thinking “What an ugly building.” I’ve been forced to look at that monstrosity for about 46 years, and my opinion hasn’t changed…..
Yep. Can anyone think of a more off putting, unfriendly, major building downtown than the tower? Fixing it at street level would take some serious architecture and dollars. What a terrible looking building. To think this is this tallest tower in Oregon as well. I actually think this building looks just fine. “Terrible” and “ugly” describe The Yard and the Portland Building, not this. The big problem, as I see it, is that this building and its stubby accomplice across the street are not just indifferent to their urban surroundings; they are hostile to the city. One is surrounded by a moat, the other is built upon a rampart. They say: “Admire us at a distance or in your passing car. See how elegant and tall we are, a fortress and a soaring tower, but you hoi polloi are to stay out.” These structures deactivate the streets that surround them. It is fitting that the recently disgraced Wells Fargo Bank owns them since they so well epitomize the self-important, anti-social ethos of corporate hubris at its worse. Well, I couldn’t put it quite so eloquently as David, but I agree with him. As silly as it may sound with those alternating white and black stripes, it makes me hearken back to the old prison striped uniforms of long ago. Very unfriendly looking. I almost expect to see a ball and chain attached to the base. Or, maybe that’s the reason for the annex across the street. Sorry, you’d have to be older to understand. David’s eloquent comments captures my opinion. 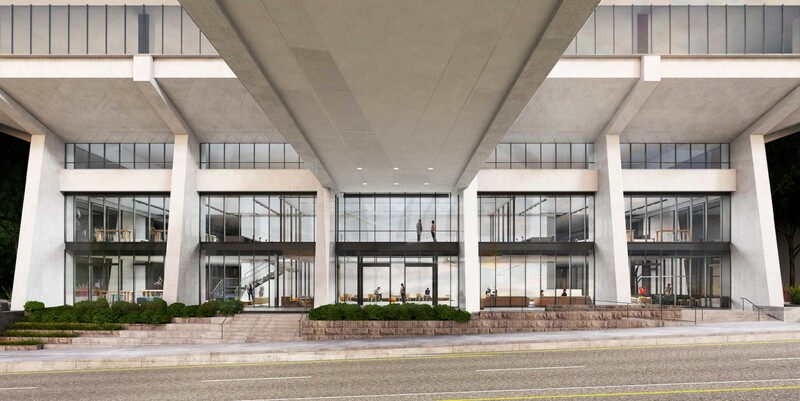 And don’t forget the skybridge that obscures the streetscape sightlines and is one more nod to separating the workforce from ground floor street level uses and pedestrians. These two buildings are the reason the city has downtown and central design guidelines and required design review. I forgot the skybridge! Ah yes, it was part of the bankers’ antiseptic dream life of 1969: living in a suburb, commuting to an underground garage, elevating to one’s office in a soaring sterile tower, taking a skybridge when needing to visit the sanctum across the street, and never ever having to set the sole of your shoe on problematic city ground. How rich to have at your disposal multiple vistas of teaming urbanity, but always kept at a safe distance. Casting shadows.